Collecting at the DeGolyer Library focuses on the U.S. West, the Spanish borderlands, transportation, business history and much more. 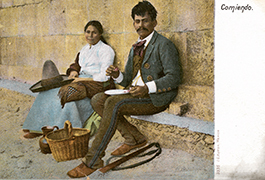 Besides books, manuscripts and maps, the DeGolyer has over 900,000 photographs and is especially rich in Mexican photography. A country of great beauty and geographical diversity, Mexico has attracted a variety of photographers from abroad as well as regional image-makers. 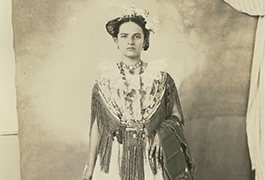 The DeGolyer has one of the most comprehensive collections of Mexican photography in the country totaling more than 10,500 photographs and 3,000 negatives, mostly from the period ca. 1865-1940. More than 50 photographers are represented at the DeGolyer, among them: Alfred Briquet, Hugo Brehme, Walter H. Horne, William Henry Jackson, Manuel Ramos, Charles B. Waite, Robert Runyon, H. J. Gutierrez, and many who are not better known, as well as collaborative publishers such as Cruces y Campa and Mayo & Weed. Subjects include landscapes, native peoples, railroads, mining, agriculture, the U.S. border, and tourist views. Collections at the DeGolyer illustrate the regime of President Porfirio Diaz (1876-1910) and the eventual struggle for power between the old guard and working class people. Mexicans felt pride in what they had accomplished in 100 years since their independence from Spain, and the 1910 Centennial brought much fanfare and local and international interest. 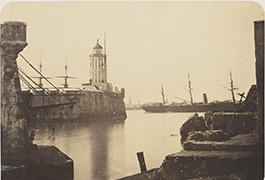 The Giesecke collection contains panoramas by Eugenio B. Downing illustrating the Mexican Centennial celebration and other views of Mexico. The year 2010 marked both the bicentennial of Mexico’s independence and the centennial of the Mexican Revolution. The Mexican Revolution (1910-1920) was a drawn-out, violent and bloody affair, and the DeGolyer has important collections relating to the conflict. The Elmer and Diane Powell Collection on Mexico and the Mexican Revolution consists of many unique materials with a focus on the Revolution period, key political and military men, and death and destruction during the rebellion. 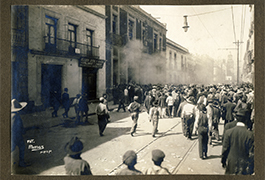 With the fighting in Mexico, many individuals became photographers with a simple box camera, selling photographs printed on postcard stock illustrating the violence during the Revolution. The struggle and carnage continued for ten years causing the death of perhaps over a million people and immigration of some 890,000 to the United States. This digital collection contains many items related to the Mexican Revolution, including 20 photographs of Cananea, Mexico, located just across the Arizona border showing striking miners, men with guns, demonstrations, the mine site, and American personnel. Among these are views of Colonel William C. Greene of Greene Consolidated Copper Company addressing strikers, June 3, 1906. The conflict is considered the beginnings of the Mexican Revolution. 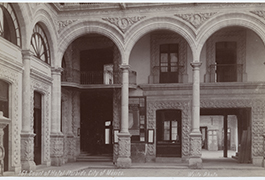 The collection also contains 43 photographic prints of the Mexican Revolution from an album by Manuel Ramos (1874-1945) illustrating damage in Mexico City during the February, 1913 uprising, also called La decena tragica ("the Ten Tragic Days") against President Francisco I. Madero (1873-1913). Included are views of the Arsenal, the destruction of President Madero's house, ruins of buildings, and Madero's funeral. Other views include Felix Diaz (1868 - 1945) and colleagues, General Victoriano Huerta (1854-1916) and cabinet, dead bodies, and fighting in Mexico City. The set of 16 mounted photographs from the Porfirio Diaz and Mexican troops, Cinco de Mayo, 1902, collection shows Porfirio Diaz (1830-1915), president of Mexico, reviewing troops. The series is believed to been taken on Cinco de Mayo, 1902, the 40th anniversary of the battle of Puebla after which the Cinco de Mayo celebration was named. The photographs were probably taken in front of Lecumberri prison in Mexico City. The Destruction of New Laredo Mexico April 24, 1914 album contains 8 photographs of municipal buildings in Nuevo Laredo, Mexico, that were destroyed in 1914 as Federal forces abandoned the city. There are dozens of postcards and photographs from the American border troops and the Mexican Revolution and the Collection of Walter H. Horne photographs, depicting stark scenes that took place, as well as Pancho Villa, Antonio Franco, Conrado H. Antuna, and more. 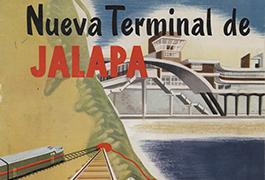 This digital collection contains hundreds of items on oil exploration and development in Mexico from the early 20th century. 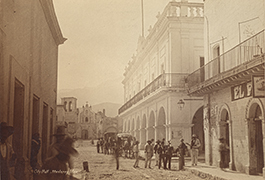 The related DeGolyer Library: Photographs, Manuscripts, and Imprints digital collection also includes dozens of photographs, maps, and documents relating to Mexican petroleum development from the Everette Lee DeGolyer, Sr. papers. Manifiesto documentado sobre la conducta publica y privada del Doctor José María Guerra, arcediano de la Santa Iglesia Catedral de Yucatan. Se da al público con el motivo que en él se espresa, 1832, by Pedro Marcial Guerra y Rodríguez Correa and published by Martin Rivera. O la Inquisición se pone, ó la religión se acaba, 1822, published by José Maria Ramos Palomera. Thayer-Nagle Album of Scenes in Mexico, containing 50 views of tourist interest along the Ferrocarril Mexicano (Mexican Railroad). 152 items from the Tourist album: Mexico, Arizona, California, Colorado and Utah, which contains 287 photographs; 139 items are in the U.S. West: Photographs, Manuscripts, and Imprints collection.